Professional wedding chair cover hire and venue styling in Barnsley, Wakefield, Leeds, Dewsbury, Pontefract, Castleford and surrounding areas. 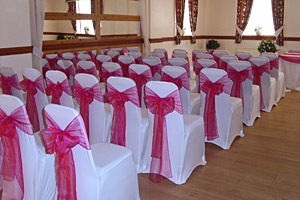 Wedding Chair Flair provide chair covers and sashes for weddings in Barnsley, Wakefield and Leeds. Our chair cover hire service provides either white or black chair covers. To compliment your colour scheme we will personally dress all of your chairs to perfection using the finest organza fabrics and arrange to collect all hired items after your event to ensure a hassle free service for both you and your venue. We can also provide a sash only hire service. 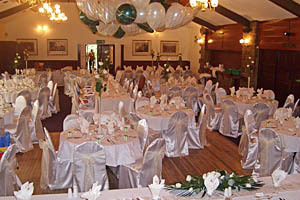 Our chair covers fit standard banqueting chairs.